Have you ever wondered what its like to be a fashion designer of an international brand? Well now, you don’t have to. With a phenomenal presence as an online retailer for both menswear and womenswear, several stores across the UK and entities in Spain and America, we were welcomed into the office of Emma Kenyon — a leading fashion designer at QUIZ. Her life at work is everything you would expect it to be and more — she’s like the real-life Miranda Priestly. But nicer of course. So, if you’re studying fashion or want to make waves in the industry, this is the girl boss that you should be looking up to and we have all the deetz you’re dying to know. Wow, you’re testing my memory now! I’ve been at QUIZ for around five years now — I guess time flies when you’re having fun. It’s interesting how I got to work here actually, I’ve always respected QUIZ as a brand and how it influenced my fashion choices when I was younger, so I rang up the HQ and told them that I thought I would make a great addition to their team even though there were no positions available, I secured two interviews and done a huge presentation in front of the decision makers! What is the first thing you do when you arrive at the office? Equipped with my coffee, I check out what has been selling that week and which styles have really taken off with our customers. This is really important from a design perspective, because once we know the type of items of customers want, we can tailor future products to those specifications! My aim is to create something that people feel proud wearing, so I spend a lot of time researching new shapes and taking inspiration from luxury brands. It’s important to strike a balance between affordability and the latest trends so that our customers can always have an up-to-date wardrobe at a low cost while not compromising on the quality of our garments. Every designer will say this, but the best part of the job is seeing something that you’ve worked on go from development to fruition in stores. I love scrolling on Instagram and seeing lots of people wearing the dresses I have designed on their nights out! There’s so much inspiration out there, but I mainly look towards trend forecasting agencies, international brands, catwalks and of course — Instagram! 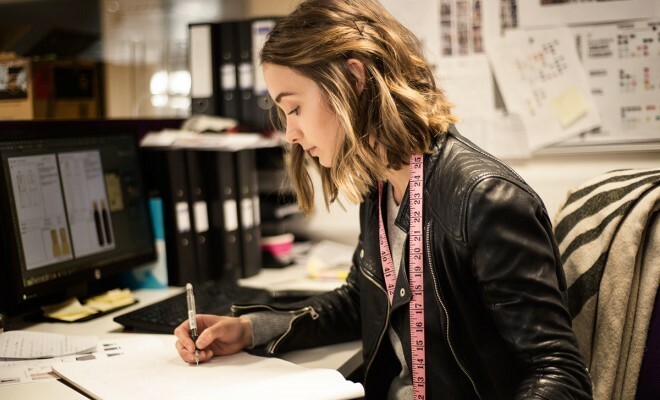 If you want to be a fashion designer, a key interest in the industry is essential. You’ll need a lot of motivation, the ability to pick commercial trends and be able to know your customers like the back of your hand! Did you study fashion related courses? You should always work hard in all of your subjects as this can really open up more opportunities for your future. I did GCSEs and A-Levels in Textiles, then moved on to an Art and Design course at college where I specialised in fashion. Then, I went to university for four years and got my fashion design degree! What advice would you give to someone who wants to work in fashion design? Getting experience is essential, reach out to companies and ask if they offer internships! Before QUIZ, I completed an internship at House of Holland in the lead up to London Fashion Week where I learnt pattern cutting. As well as this, I also worked in John Lewis’ head office as an intern where I learnt CAD design skills. Take as many opportunities as you can — it will look great on your CV!